The System x3550 M4 server provides outstanding performance for your mission-critical applications. Its energy-efficient design supports more cores, memory, and data capacity in a compact 1U package that is easy to service and manage. With more computing power per watt and the latest Intel Xeon processors, you can reduce costs while maintaining speed and availability. This product guide provides essential pre-sales information to understand the structure of the x3550 M4 (E5-2600) offering, its key features and specifications, components and options, and configuration guidelines. This guide is intended for technical specialists, sales specialists, sales engineers, IT architects, and other IT professionals who want to learn more about the x3550 M4 (E5-2600) and consider its use in IT solutions. Note: This Product Guide describes withdrawn models of the x3550 M4 with the Intel Xeon processor E5-2600 product family. For currently available x3550 M4 models with the Intel Xeon processor E5-2600 v2 product family, see the Product Guide System x3550 M4 (E5-2600 v2). The System x3550 M4 server provides outstanding performance for your business-critical applications. Its energy-efficient design supports more cores, memory, and data capacity in a compact 1U package that is easy to service and manage. With more computing power per watt and the latest Intel Xeon processors, you can reduce costs while maintaining speed and availability. Suggested use: database, virtualization, enterprise applications, collaboration/email, streaming media, web, HPC, and cloud applications. Figure 1 shows the System x3550 M4. The x3550 M4 offers a flexible, scalable design and a simple upgrade path to eight HDDs plus an optical drive at the same time, and up to 768 GB of memory. The flexible onboard Ethernet solution provides four standard integrated Gigabit Ethernet ports and two optional embedded 10 Gb Ethernet ports without occupying PCIe slots. Comprehensive systems management tools with the next-generation Integrated Management Module II (IMM2) make it easy to deploy, integrate, service, and manage. Combining balanced performance and flexibility, the x3550 M4 is a great choice for small and medium businesses and up to the large enterprise. It can provide outstanding uptime to keep business-critical applications and cloud deployments running safely. Ease-of-use and comprehensive systems management tools make it easy to deploy. Outstanding RAS and high-efficiency design improves your business environment and helps save operational costs. Supports up to 768 GB memory with 32 GB LRDIMMs. Intel Advanced Vector Extensions (AVX) significantly improve floating point performance for compute-intensive technical and scientific applications compared to Intel Xeon 5600 series processors. The server has four integrated Gigabit Ethernet ports and two optional 10 Gb Ethernet ports with mezzanine cards that do not consume a PCIe slot. The server offers PCI Express (PCIe) 3.0 I/O expansion capabilities that improve the theoretical maximum bandwidth by almost 100% (8 GTps per link using 128b/130b encoding) compared to the previous generation of PCI Express 2.0 (5 GTps per link using 8b/10b encoding). Support for NVIDIA Quadro graphics processing units (GPUs) to maximize computing power. 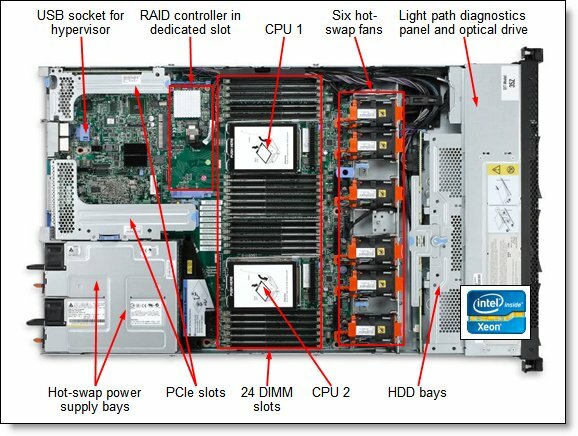 The server has two redundant hot-swap power supplies and six dual-motor hot-swap redundant fans (two fan zones with N+1 fan design) to provide availability for business-critical applications. The power source-independent light path diagnostics panel and individual light path LEDs quickly lead the technician to failed (or failing) components. This simplifies servicing, speeds up problem resolution, and helps improve system availability. Predictive Failure Analysis (PFA) detects when system components (processors, VRMs, memory, hard disk drives, fans, and power supplies) operate outside of standard thresholds and generates proactive alerts in advance of possible failure, therefore increasing uptime. An integrated Trusted Platform Module (TPM) 1.2 support enables advanced cryptographic functionality such as digital signatures and remote attestation. IBM Systems Director offers comprehensive systems management tools that help to increase uptime, reduce costs and improve productivity through advanced server management capabilities. The x3550 M4 is Energy Star 2.0 compliant. Energy Star is the trusted, US government-backed symbol for energy efficiency, with the goal of helping customers save money and protect the environment through energy efficient products and practices. High-efficiency 550 W and 750 W power supplies with 80 PLUS Platinum certification. Available 750 W dc power supply option. The Intel Xeon processor E5-2600 product familiy offers significantly better performance over the previous generation, while fitting into the same TDP limits. Processor Up to two Intel Xeon processor E5-2600 product family CPUs with eight cores (up to 2.9 GHz) or six cores (up to 2.9 GHz) or quad-cores (up to 3.3 GHz). Two QPI links up to 8.0 GT/s each. Up to 1600 MHz memory speed. Up to 20 MB L3 cache. Memory Up to 24 DIMM sockets (12 DIMMs per processor). RDIMMs, UDIMMs and LR-DIMMs (Load Reduced DIMMs) are supported but memory types cannot be intermixed. Memory DIMM speeds up to 1600 MHz. Disk drive bays Up to eight 2.5" hot-swap SAS/SATA HDDs, or up to three 3.5" hot-swap SAS/SATA HDDs, or up to three 3.5" Simple Swap SATA HDDs. Maximum internal storage Up to 14.4 TB with 1.8 TB 2.5" SAS HDDs, or up to 8 TB with 1 TB 2.5" NL SAS/SATA HDDs, or up to 12.8 TB with 1.6 TB 2.5" SAS/SATA SSDs, or up to 18 TB with 6 TB 3.5" NL SAS/SATA HDDs. Intermix of SAS/SATA is supported. 6 Gb SAS/SATA: RAID 0, 1, 10 with H1110, M1115 or M5110. Optional upgrades to RAID 5, 50 available for M1115. Optional upgrades to RAID 5, 50 are available for M5110 (zero-cache; 512 MB battery-backed cache; 512 MB or 1 GB flash-backed cache). Optional upgrade to RAID 6, 60 are available for M5110 with 512 MB or 1 GB cache upgrades. 12 Gb SAS/SATA: RAID 0, 1, 10 with optional M5210. Optional upgrades to RAID 5, 50 are available for M5210 (zero-cache; 1 GB non-backed cache; 1 GB or 2 GB flash-backed cache). Optional upgrade to RAID 6, 60 are available for M5210 with 1 GB or 2 GB cache upgrades. Optical drive bays One, optional, for models with 2.5" drives. Support for DVD-ROM or Multiburner. Network interfaces Four integrated Gigabit Ethernet 1000BASE-T ports (RJ-45); two integrated 10 Gb Ethernet ports (10GBASE-T RJ-45 or 10GBASE-SR SFP+ based) on optional 10 Gb Ethernet mezzanine card (does not consume a PCIe slot). Additional dedicated slot for ServeRAID adapter. Ports Two USB 2.0 (three USB 2.0 for 3.5" HDD models) and one DB-15 video on front. Four USB 2.0, one DB-15 video, one DB-9 serial, one RJ-45 systems management, four RJ-45 GbE network ports, two optional RJ-45 or SFP+ 10 GbE network ports on rear. One internal USB ports (for embedded hypervisor). Cooling Calibrated Vectored Cooling™ with up to six N+1 redundant hot-swap fans (four standard, additional two with second processor or with the x3550 M4 Thermal Solution Kit); two fan zones with N+1 fan design; each fan has two motors. Power supply Up to two redundant hot-swap 550 W AC or 750 W AC power supplies (80+ Platinum certification), or 750 W DC power supply options. Hot-swap parts Hard drives, power supplies, fans. Systems management UEFI, Integrated Management Module 2 (IMM2), Predictive Failure Analysis, Light Path Diagnostics, Automatic Server Restart, IBM Systems Director and IBM Systems Director Active Energy Manager™, ServerGuide. Optional Advanced Management Module Advanced Upgrade (FoD) for remote presence (graphics, keyboard and mouse, virtual media). Operating systems supported Microsoft Windows Server 2012 R2, 2012, 2008 R2 and 2008; Red Hat Enterprise Linux (RHEL) 5, 6, and 7; SUSE Linux Enterprise Server (SLES) 10, 11, and 12; VMware ESX 4.1 and ESXi 4.1, VMware vSphere (ESXi) 5.0, 5.1, and 5.5. Service and support Optional service upgrades are available through Lenovo Services: 4-hour or 2-hour response time, 8 hours fix time, one-year or two-year warranty extension, remote technical support for System x hardware and selected third-party (Microsoft, Linux, VMware) software. † Processor detail: Processor quantity and model, core speed, number of cores, L3 cache, memory speed. * Model 7914DDx is a management server for offerings such as cloud. Model 7914DDx is a model optimized as a management node and is preloaded with Windows Server 2008 R2 Standard and IBM Systems Director. The x3550 M4 supports the processor options listed in the following table. The server supports up to two processors. This table shows which server models have each processor standard. If there is no corresponding where used model for a particular processor, then this processor is only available through CTO. The part numbers include two system fans. System x DDR3 memory is compatibility tested and tuned for optimal System x performance and throughput. System x memory specifications are integrated into the light path diagnostics for immediate system performance feedback and optimum system uptime. From a service and support standpoint, System x memory automatically assumes the system's warranty, and Lenovo provides service and support worldwide. The System x3550 M4 supports DDR3 memory. The server supports up to 12 DIMMs when one processor is installed, and up to 24 DIMMs when two processors are installed. Each processor has four memory channels, and there are three DIMMs per channel. Server supports UDIMMs, RDIMMs, and LRDIMMs. Mixing different types of memory (UDIMMs, RDIMMs, and LRDIMMs) is not supported. Mixing 1.5 V and 1.35 V DIMMs in the same server is supported; in such cases, all DIMMs operate at 1.5 V.
The maximum number of ranks supported per one channel is eight (with the exception of Load Reduced DIMMs, where more than eight ranks are supported because one quad-rank LRDIMM provides the same electrical load on a memory bus as a single-rank RDIMM). The maximum quantity of DIMMs that can be installed in server depends on number of CPUs, DIMM type, rank, and operating voltage as shown in the "Maximum quantity" row in the following table. The memory speed supported by the specific CPU. The lowest of maximum operating speeds for the selected memory configuration that depends on rated speed, operating voltage, and quantity of DIMMs per channel, as shown under "Maximum operating speed" section in the following table. The following table (Parts 1 and 2) shows the characteristics of the supported DIMMs. Tables cells highlighted with a gray background indicate when the combination of DIMM voltage and the number of DIMMs per channel still allows the DIMMs to operate at a rated speed. * Maximum quantity supported is shown for two processors installed. When one processor installed the maximum quantity supported is a half of shown. If memory mirroring is used, then DIMMs must be installed in pairs (a minimum of one pair per each CPU), and both DIMMs in a pair must be identical in type and size. The following table lists memory options available for the x3550 M4 server. Figure 5 shows the first three of these configurations. All standard models, except C4x, ship with four 2.5" Slim-SFF SAS/SATA hot-swap hard drive bays. Model C4x ships with three 3.5" SAS/SATA hot-swap hard drive bays. The following table shows the internal storage expansion options available for the x3550 M4 server. Option 81Y6657 upgrades models with four hot-swap HDD bays to eight hot-swap HDD bays. Models A2x and A3x require H1110 to be replaced by M1115 or M5110 to support eight HDDs. An optical drive can be installed internally when this option is used. Option 00Y7297 together with option 00Y8597 upgrades CTO models with four 12 Gb 2.5" hot-swap drive bays to eight 12 Gb hot-swap 2.5" drive bays. The following table lists the RAID controllers and the additional options used for the internal disk storage of the x3550 M4 server. The controllers are installed into a dedicated PCIe slot. † This FoD upgrade requires a cache memory upgrade. The following table lists hard drive options for internal disk storage of the x3550 M4 server. The server does not support internal tape drive options or other internal backup units. However, it can be attached to the external tape drives using SAS or Fibre Channel connectivity (see Table 26). The server supports the optical drive options listed in the following table. Server models with 3.5" HDDs do not support internal optical drive; they provide a third USB port on the front for an external optical drive. Riser 1 supplies slot 1, and riser 2 supplies slot 2. All standard models except for model DDx have two riser cards installed that provide one PCIe x16 Gen 3 slot and one PCIe x8 Gen 3 slot (features A1HJ and A1HK). Model DDx has two PCIe x16 slots (A1HJ and A1HL). The Thermal Solution Kit is not needed if two processors are installed, since the second processor includes these fans. * For CTO orders, quantity two of feature code A40L, x3550 M4 Addl Fan for High Performance Adapters will be substituted. The x3550 M4 supports four integrated Gigabit Ethernet ports. Optionally, two 10 Gb Ethernet ports can be added by installing the a dual-port 10 Gb Ethernet mezzanine card as listed in the following table. Mezzanine cards use a dedicated connector on the system board and do not consume a PCI expansion slot. † The QLogic Dual Port 10GbE SFP+ Embedded VFA and QLogic 8200 Dual Port 10GbE SFP+ VFA both require the x3550 M4 Thermal Solution Kit, 00Y7117 or the second processor (with additional system fans). The following table lists storage HBAs supported by the x3550 M4 server. The server supports a graphics processing unit (GPU) provided the x16 riser card (69Y5671, feature A1HL) is installed. The server provides up to 225W of external power to each GPU. The following table lists the supported GPUs. * These GPU adapters are available via Special Bid or CTO only. If the NVIDIA Quadro K600 is installed, the maximum memory that can be installed is 1 TB. The server supports up to two redundant power supplies, providing N+1 redundancy. Standard models come with one or two power supplies (model dependent). The following table lists the power supplies. An AC power supply ships standard with one 2.8 m C13 - C14 power cord. This will ensure that the right power supply is chosen for optimal performance. The server contains Integrated Management Module II (IMM2), which provides advanced service-processor control, monitoring, and an alerting function. If an environmental condition exceeds a threshold or if a system component fails, the IMM lights LEDs to help you diagnose the problem, records the error in the event log, and alerts you to the problem. Optionally, the IMM also provides a virtual presence capability for remote server management capabilities. All standard models ship with a pop-out light path diagnostics panel on the front of the server (See Figure 2). Configure-to-order (CTO) customers may elect to deselect this feature and instead have a basic light path diagnostics panel on the front of the server. The following table shows the two light path diagnostics features. The System x3550 M4 has a three-year warranty with 24x7 standard call center support and 9x5 Next Business Day onsite coverage. Also available are Lenovo Services warranty maintenance upgrades and post-warranty maintenance agreements, with a well-defined scope of services, including service hours, response time, term of service, and service agreement terms and conditions. The server supports attachment to external storage expansion enclosures, such as the EXP2500 series, by using the ServeRAID M5120 SAS/SATA Controller. ** The ServeRAID M5120 SAS/SATA Controller requires the x3550 M4 Thermal Solution Kit, 00Y7117 or the second processor (with additional system fans). he controllers support connectivity to the external expansion enclosures listed in the following table. Up to nine expansion enclosures can be daisy-chained per one external controller port. For better performance, distribute expansion enclosures evenly across both ports of a controller. The following table lists the drives supported by EXP2512 external expansion enclosures. The following table lists the hard disk drives supported by EXP2524 external expansion enclosures. The following table lists the external storage systems that are offered by Lenovo that can be used in x3550 M4 solutions. The following table lists the external backup options that are offered by Lenovo that can be used in x3550 M4 solutions. The following table lists the top-of-rack Ethernet switches that are offered by Lenovo that can be used in x3550 M4 solutions. The following table lists the uninterruptible power supply (UPS) units that are offered by Lenovo that can be used in x3550 M4 solutions. The following table lists the power distribution units (PDUs) that are offered by Lenovo that can be used in x3550 M4 solutions. The following table lists the rack cabinets that are offered by Lenovo that can be used in x3550 M4 solutions.